Hello everyone, exciting news: the 2018 One Book One San Diego pick was recently announced! This year’s title is the graphic novel March: Book One, by Congressman John Lewis. 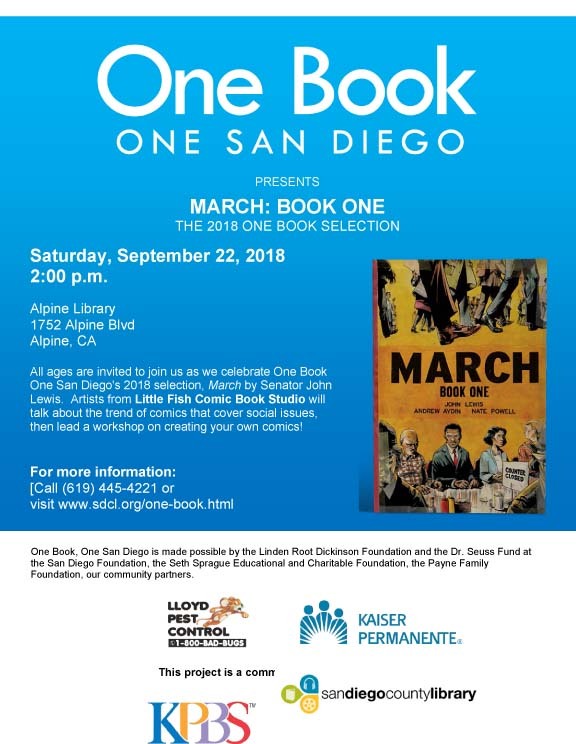 One Book, One San Diego is a community reading program managed by KPBS in partnership with the San Diego County Library and the San Diego Public Library. The purpose of the program is to encourage residents to join together in the shared experience of reading and discussing the same book. The program also encourages participation in related events, discussions of the ideas raised in the featured books, and examination of how these ideas connect with our daily lives and local communities. The first in a series of three, March: Book One is a vivid first-hand account of John Lewis’ lifelong struggle for civil and human rights, meditating in the modern age on the distance traveled since the days of Jim Crow and segregation. Rooted in Lewis’ personal story, it also reflects on the highs and lows of the broader civil rights movement. We are celebrating One Book One San Diego with a fun all-ages event on Saturday, September 22 at 2 pm. Artists from Little Fish Comic Book Studio will talk about the trend of comics that address social issues, then lead a workshop on creating your own comics! 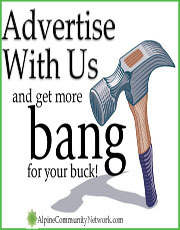 All materials will be provided and the workshop is free. As always, many thanks to the Alpine Library Friends Association for their continuing support of our library. 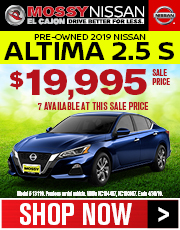 Visit the ALFA Bookstore and help support our collection and programs. Bookstore hours are Tuesdays, 10 AM – 7:30 PM and Wednesdays – Saturdays, 10 AM – 4:30 PM. As a final note, September is National Library Card Month, and to celebrate we are waiving fees for replacement library cards. If your card is worn out, or you just want a different color, now’s your chance to get a new one. The whole family is invited to bring a blanket or chair and enjoy an evening of free music at the Alpine Community Center Park behind the library. Sign up for a practice test to see how you might perform on test day! Afterward, Sylvan Learning will provide you with a personalized evaluation of your performance and suggestions of how you might improve your score. 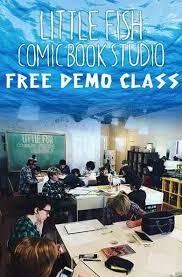 To register, email SAT-Test@alpinelibraryfriends.org. Kids will learn all about how easy it is to compost food waste with red wriggler worms at this interactive presentation with Solana Center! Join Jeanne Talbot of the Jane Austen Society for a discussion of Jane Austen’s novel “Persuasion”. Tea and light refreshments will be served, and we hope you’ve read the book! We’re celebrating Talk Like a Pirate Day with our favorite pirate, Captain Book! Join us for a story and meet and greet, followed by a treasure hunt! Adrienne Nims and Spirit Wind take you on a musical journey with lush harmonies, mystical melodies, and global rhythms. The band’s music is eloquent, earthy, and multidimensional, combining jazz, Latin, Asian, R&B, and many different styles from around the globe. 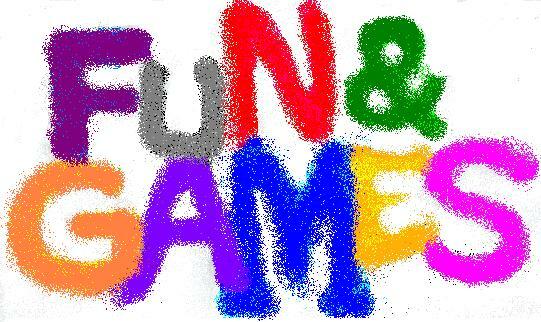 Friday Fun & Games – Every Week at the Alpine Library! 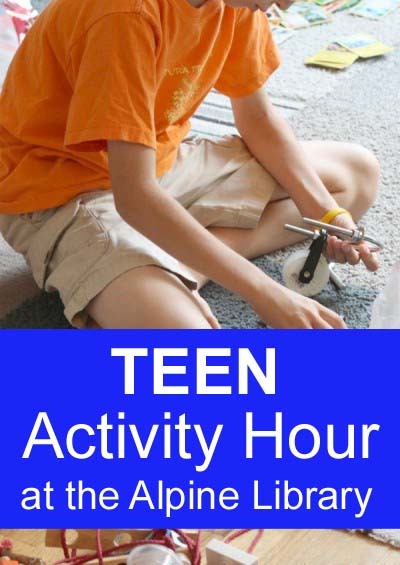 Teen (Grades 6-12) Activity Hour EVERY WEDNESDAY at the Alpine Library! Every Weds! Tweens & Teens (Grades 6-12) are invited to enjoy our variety of Arts, Crafts & Games after school at the Alpine Library. Bring a friend! 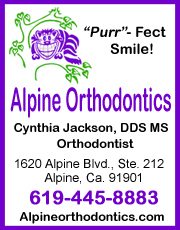 The Alpine Library is located at 1752 Alpine Blvd, Alpine, CA 91901. 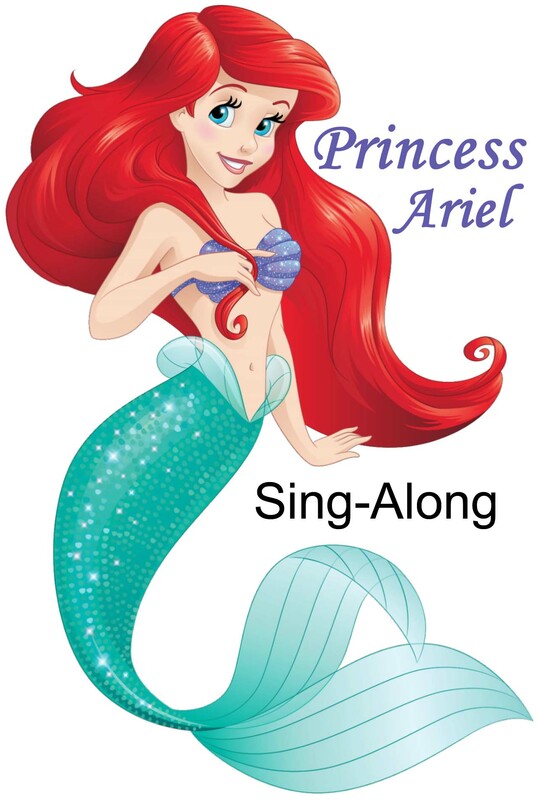 Princess Ariel Sing-Along at the Alpine Library on Friday, July 20, 2018 at 3 pm! Princess Ariel will join us for a story, song, and meet and greet!The Alpine Library is located at 1752 Alpine Blvd Alpine, CA 91901. 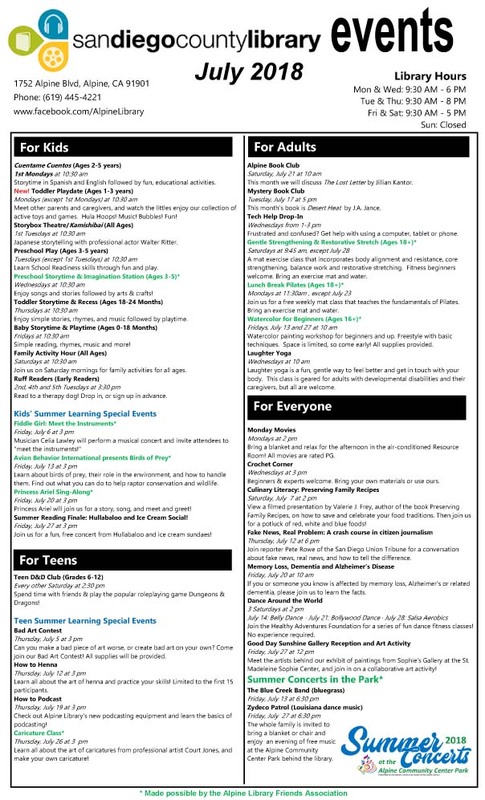 Our Summer Reading/Summer Learning program is in full swing this month—we have all kinds of activities for everyone from babies to seniors. 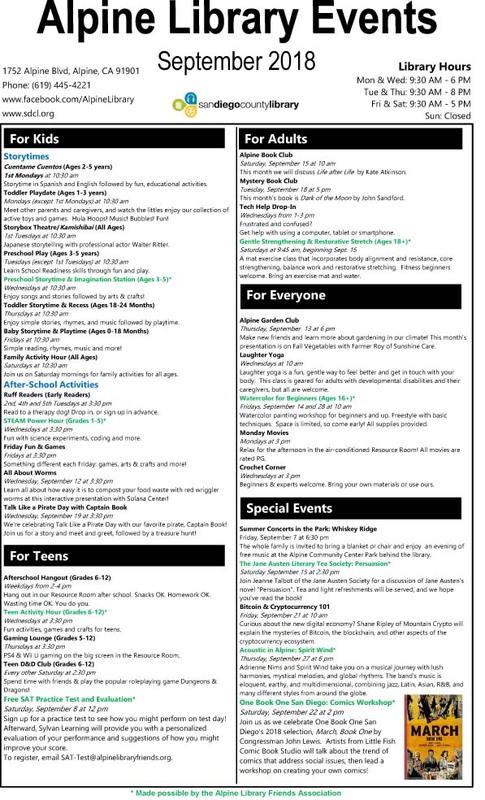 Don’t forget to grab your reading/activity log…this is for all ages, not just kids, and we have some great prizes this year! On Mondays at 10:30, we have a new program, Toddler Playdate–meet other parents and caregivers, and watch the littles enjoy our collection of active toys and games. Hula Hoops! Music! Bubbles! Fun! 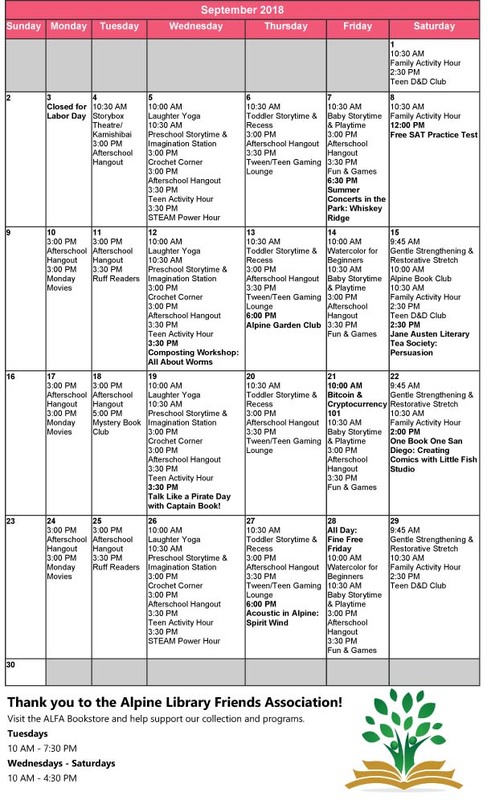 This is every Monday except the first Monday of the month, when we have English/Spanish storytime with Ms. Paula. ¡Vamos a la fiesta! On Monday afternoons at 2, we’re having a summer movie series—bring a blanket and relax for the afternoon in the air-conditioned Resource Room. All movies are rated PG. Call or stop by the library to find out what’s playing! Bad Art Contest, July 5: Can you make a bad piece of art worse, or create bad art on your own? Come join our Bad Art Contest! 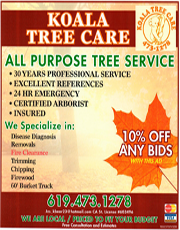 All supplies will be provided. 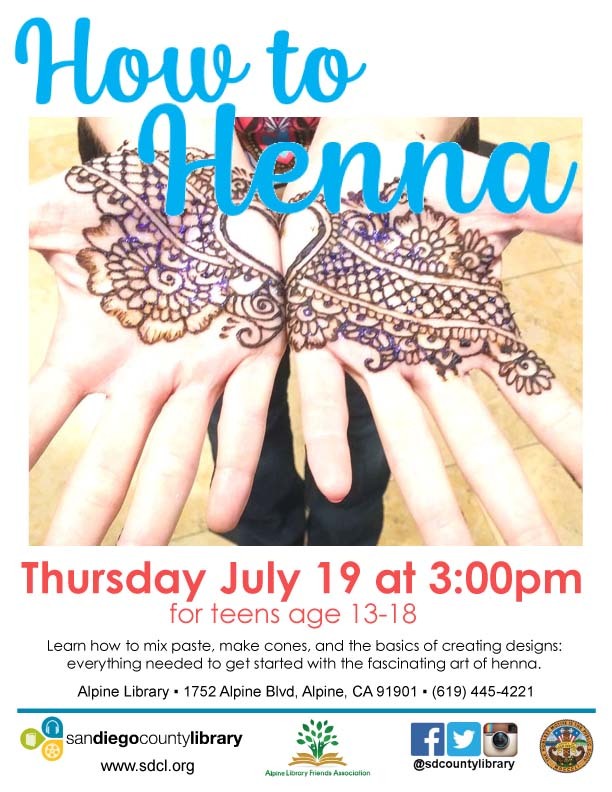 How to Henna, July 12: Learn all about the art of henna and practice your skills! Limited to the first 15 participants. 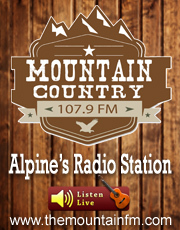 How to Podcast, July 19: Check out Alpine Library’s new podcasting equipment and learn the basics of podcasting! Caricature Class, July 26: Learn all about the art of caricatures from professional artist Court Jones, and make your own caricature! Wild Wonders, June 29: Join us for our official Summer Reading Program kickoff featuring a live animal show from Wild Wonders. Learn all about animals all over the world and help us celebrate this summer’s theme: Reading Takes You Everywhere! 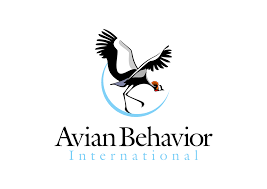 Avian Behavior International presents Birds of Prey, July 13: Learn about birds of prey, their role in the environment, and how to handle them. Find out what you can do to help raptor conservation and wildlife. Princess Ariel Sing-Along, July 20: Princess Ariel will join us for a story, song, and meet and greet! Summer Reading Finale, July 27: Join us for a fun, free concert from Hullabaloo and ice cream sundaes! View a filmed presentation by Valerie J. Frey, author of the book Preserving Family Recipes, on how to save and celebrate your food traditions. Then join us for a potluck of red, white and blue foods! 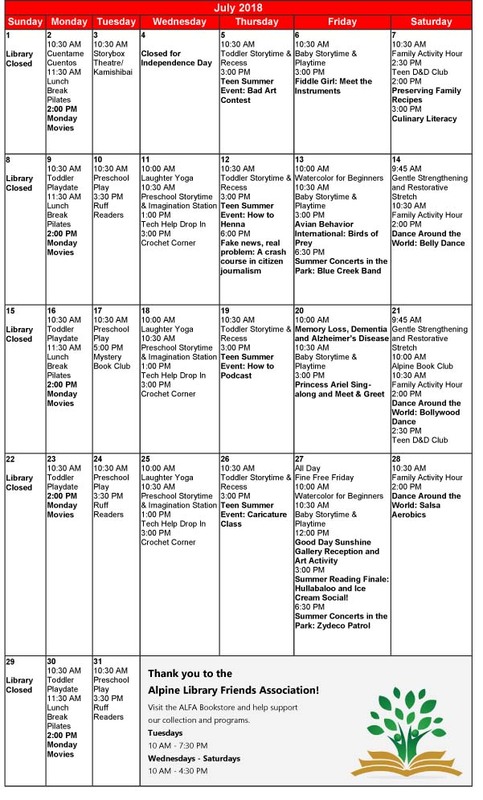 Join the Healthy Adventures Foundation for a series of fun dance fitness classes! Beginners welcome. If you or someone you know is affected by memory loss, Alzheimer’s or related dementia, please join us to learn the facts. Meet the artists behind our exhibit of paintings from Sophie’s Gallery at the St. Madeleine Sophie Center, and join in on a collaborative art activity for all ages! Finally, the Summer Concert Series is back for 2018! All concerts are on Friday at 6:30 pm–The whole family is invited to bring a blanket or chair and enjoy an evening of free music at the Alpine Community Center Park behind the library. 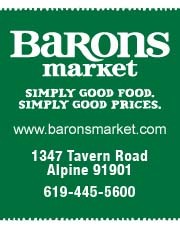 Food will be available for purchase from local vendors. 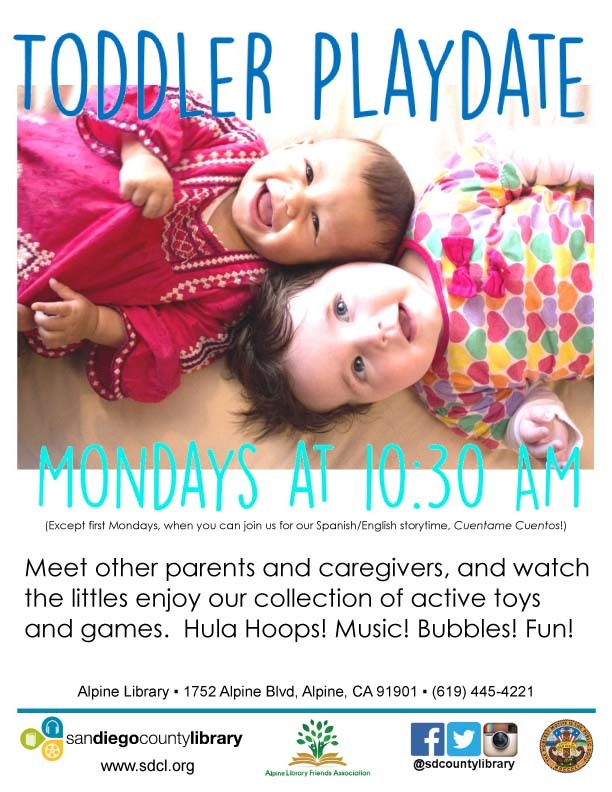 New at the Alpine Library – TODDLER PLAYDATE Every Monday! New activity at the Alpine library – TODDLER PLAYDATE! Beginning on July 9, 2018 – Join us EVERY MONDAY at 10:30am (Except first Mondays of the month, when you can join us for our Spanish/English storytime, Cuentame Cuentos!) Meet other parents and caregivers, and watch the littles enjoy our collection of active toys and games. Hula Hoops! Music! Bubbles! Fun! Wild Wonders! 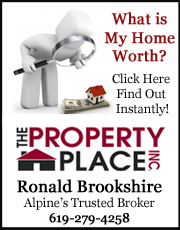 June 29, 2018 at 3pm at the Alpine Library! Join us for our official Summer Reading Program kickoff featuring a live animal show from Wild Wonders. Learn all about animals all over the world and help us celebrate this summer’s theme: Reading Takes You Everywhere!